Serving Madison, Wisconsin and surrounding areas, including Arena, Cross Plains, Dane, Deerfield, Deforest, Fitchburg, Lodi, McFarland, Middleton, Mt. Horeb, Paoli, Prairie du Sac, Roxbury, Sauk City, Spring Green, Stoughton, Sun Prairie, Token Creek, Verona, Watertown, Waunakee, Westport, Whitewater, and others. If you don't see your town or city listed here, just ask us! 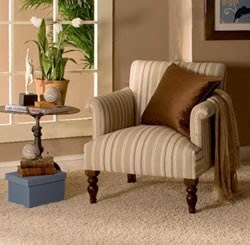 Three Rooms Carpet Cleaned for $99.99! Refresh and renew your home by cleaning your upholstery, rugs, and carpets. Your carpet and upholstery are like giant filters in your home, trapping particles that will stay there until they're removed. The typical carpet needs to be deep cleaned at least once a year to remove embedded dirt before permanent damage occurs. And, unseen particles are causing damage not only to the appearance of your carpet and upholstery, but also to the health and safety of your home. Regular cleaning can extend the life of your carpet for years, too. Call or email us today for a free quotation. We'll give you fast and friendly service. We've been in business for years for a reason! Serving Madison, Wisconsin and surrounding area, including Arena, Arlington, Baraboo, Cross Plains, Dane, Deerfield, Deforest, Fitchburg, Lodi, McFarland, Middleton, Mt. Horeb, Paoli, Prairie du Sac, Roxbury, Sauk City, Spring Green, Stoughton, Sun Prairie, Token Creek, Verona, Waunakee, Westport, Whitewater, Windsor, Wisconsin Dells, and others. Don't see your town listed? Just ask us!